In 1910, the Austrian architect and design genius Josef Hoffman created the most gorgeous corn holders ever. Now exclusively sold by the Neue Galerie, the elegant, minimalist sterling silver holders can be purchased by the corn-eater who will only accept the best for $350 for two pairs. 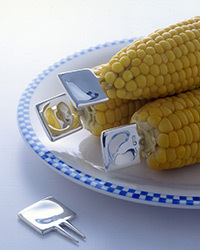 Amazon is currently offering some more traditional corn holders (corn-shaped, in plastic and stainless steel) at a more accessible price point ($3.77 for a set of six).